EVERTON HEAD INTO Saturday’s Merseyside derby on the back of a 3-0 midweek League Cup defeat to Swansea and a 3-2 loss to Crystal Palace last weekend. With five points from their first five league games, it’s the club’s worst domestic start since 2010. With results not great, there’s also the added significance of Everton’s dismal history at Anfield. Tomorrow’s fixture comes fifteen years exactly after Kevin Campbell’s fourth-minute goal gave them a rare victory. They haven’t won there since and Roberto Martinez’s first taste of the derby didn’t exactly go too well last season when a first-half blitz led to an extremely comfortable 4-0 Liverpool win. But there are two reasons for Everton to feel optimistic: James McCarthy and Seamus Coleman. Earlier this week, Martinez was singing the praises of the ex-Wigan man, remarking that he is ‘one of the best midfielders in the league’. Ever since his £13m move from the Latics in the summer of 2013, McCarthy has been first-choice and he’s maturing into an impressive presence. Though many would consider the comments from Martinez as outlandish or over-the-top, they certainly have merit. From a passing perspective, McCarthy offers up similar numbers to the league’s finest. Averaging 65 passes per game, he’s on par with Steven Gerrard and fractionally trails the likes of Mikel Arteta, Mesut Ozil and David Silva. McCarthy is afforded much more freedom than his midfield partner because of his all-round capabilities. Last term, he was a combative influence and he’s continued that trend into this campaign. He’s Everton’s most frequent tackler, averaging close to three per game. In the Europa League clash against Wolfsburg, he made an impeccable challenge deep in injury time that showcased his work ethic, desire and appreciation for a dying art. Having scored just once in 31 league starts for the club last season, many would urge McCarthy to get among the goals more often. But with Romelu Lukaku, Samuel Eto’o, Steven Naismith, Kevin Miralles and Aiden McGeady (not to mind the two full-backs) all on the mark already this season, there’s not much pressure on his shoulders to find his shooting boots. What he can do is pop up in dangerous positions and offer some creativity in the final third. It’s not a common aspect to his game and he’s averaging 0.2 key passes per game (registering just one from five league fixtures so far). But against Palace, he had two major involvements. Firstly, his incisive pass to Leon Osman led to Lukaku’s opening goal while inside the last ten minutes, he was brought down in the area after some neat chest control and Leighton Baines converted the resultant penalty. Coleman had an incredible 2013/2014 campaign, scoring six league goals in 36 appearances. He hasn’t started too badly this season with one goal and one assist in his 3 league starts. Though Leighton Baines is the darling of Goodison Park, Coleman is a much more explosive full-back and Everton utilise it as much as possible. Against Arsenal, he showed intelligence, pace and astute finishing to put his side 2-0 up. The following week against Chelsea, he punished Jose Mourinho’s side for affording him far too much space – sending over an inch-perfect cross for Kevin Mirallas to power a great header to the net. What sets Coleman apart from Baines (and many other full-backs for that matter) is that the self-belief and ‘arrogance’ that Martinez has spoken of has pushed his game to another level. As mentioned earlier, full-backs are normally conditioned to make a pass inside should their passage up the flank be blocked off. Coleman still backs himself in one v one situations and has the pace and trickery to beat opponents with ease. His goal against Southampton last season is a perfect example of that self-belief. Coleman’s influence in the final third can’t be overstated. Against Chelsea, he was a relentless attacking weapon (perhaps to the detriment of Everton’s defensive setup) though with Mourinho’s side having an issue with tracking or losing runners (most notably Andre Shurrle and James Milner last weekend), it was clearly a ploy from Roberto Martinez to probe a weakness in their defence. It’ll be interesting to see what formation Brendan Rodgers plays tomorrow because Coleman will need to be monitored closely. A midfield diamond will leave plenty of space on the flanks so it’s likely they’ll revert to a version of a 4-3-3 or play a flat four across the middle. In the 4-0 loss at Anfield last term, Coleman didn’t play but he did feature in the 3-3 draw and Rodgers selected a defensive side that day with Gerrard, Henderson, Lucas and Allen all starting while Coutinho played off Suarez. At home it’s a slightly different prospect and Rodgers will want to involve his main attacking threats, especially given their lack of urgency and energy in the final third so far this season. Also, by selecting somebody like Sterling in his natural wide position, it gives Coleman plenty to think about and might curb his attacking instincts as a result. Email “Analysis: Why James McCarthy and Seamus Coleman are so important for Everton”. 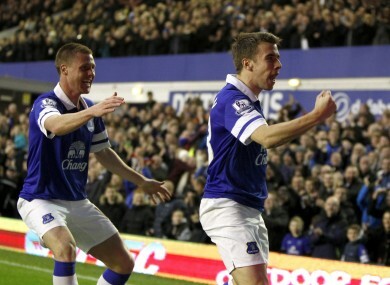 Feedback on “Analysis: Why James McCarthy and Seamus Coleman are so important for Everton”.